Find out how you are protected when organizing. Under the law in Alberta, you have legal rights as a worker. Teamsters Union 987 is part of a legacy of trade unions that have fought for over a century to guarantee that every workplace has standards in place, but there is still work to do. The most important right to be aware of is that you are, without question, allowed to organize (form or join a labour union) in your workplace, regardless of where you work. Unfortunately, most employers will be resistant to bringing a union into their company, so being aware of your right to organize is essential. If your employer violates any of the following rights at any point in the process of forming a union, contact your Teamsters Union 987 organizer (link to Contact page) – outside of work hours – immediately. Distributing flyers and other informational tools. 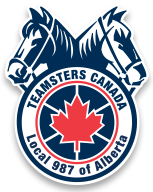 You have the right to lodge a formal complaint against your employer with the help of Teamsters Union 987 if they have legitimately acted against the Alberta Labour Relations Code. You have the right to vote in favour of forming a union without any interference from your employer. Distributing any anti-union materials in an attempt to persuade employees’ decisions to unionize. Not sure if your rights are being violated? Here are some links to help you decide. Teamsters Union 987 are always available to answer any questions you have about your rights. Contact us at anytime. We are here to help.